What is better than an afternoon spent with friends and food? This afternoon we officially closed out the 2015/2016 Competitive Season with our Annual Awards Banquet. It was so nice getting to see everyone outside the gym and it not be because we are at a meet! Thank you to all our coaches for your hard work and dedication. Without your tireless effort our kids would not have the success they do! A very special thank you to Debbie who continues to dedicate countless hours each year. Her diligence and expertise is priceless! A big thank you to all parents. Each one of you plays a vital role in contributing to the success of the team! Some roles may be more visible, some may be completely behind the scenes, but we can’t do it without you! And last but not least, thanks Melissa, Kelsey and everyone else who put together today’s banquet. Parents and athletes, if you have better pictures, please send them! Any photographers / photo enthusiasts out there? (hint, hint, hint…) Here’s to a great season last year and an even better one this year! 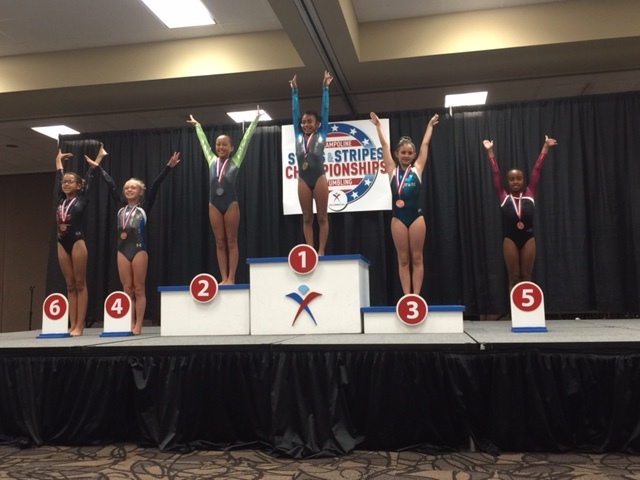 Five of our level 5-7 athletes braved the heat wave and traveled to the 2016 Stars and Stripes Championships in Tulsa, OK. Awards were given to the top 6 places in each category. Complete results can be found on the USAG website and Fairland results will be posted under the results tab of our website soon. Congratulations to all our athletes for a job well done! Great job, we are proud of you! Being an Olympic year, the main focus at the 2016 USA Gymnastics Championships was on the Olympic Selection event. Even so, the competition in the Rhode Island Convention Center where all other athletes competed was fierce! In addition to our Synchro medalists, congratulations to Neomie who won the silver medal in DMT for level 9, 11-12 women! She handled the pressure and had her highest score in finals! Jessica hung in there and won the bronze medal in junior elite women’s trampoline. The competition was intense, only 0.035 separated 2nd and 3rd places! 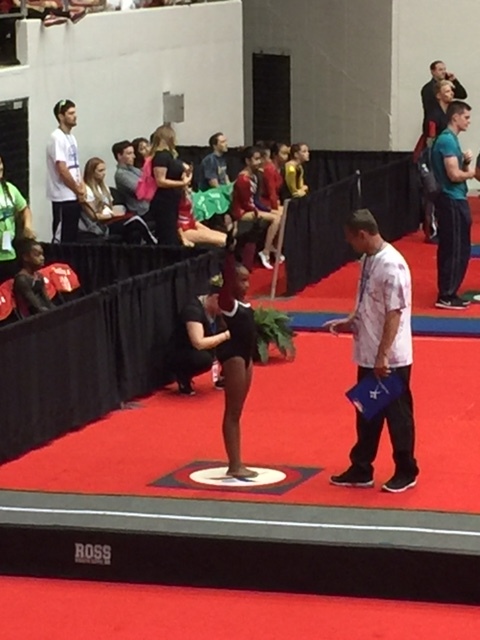 Jessica’s performances at 2016 Elite Challenge and the 2016 USA Gymnastics Championships secured her a spot on the 2016/2017 Junior National Trampoline Team. Congratulations Jessica! Every year, rules and procedures are tweaked, changed, modified. 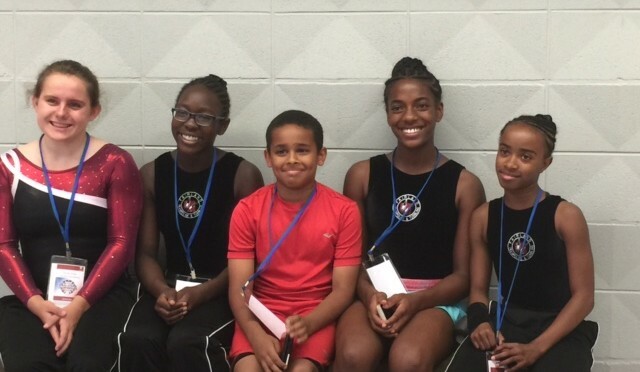 Late May, USAG announced that only the top 6 athletes in each level 8-10 division would receive awards. There was no change for elites where only the top 3 receive awards. However, here are Fairland’s top 8 finishers. Congratulations to all our athletes. It was a fun week! 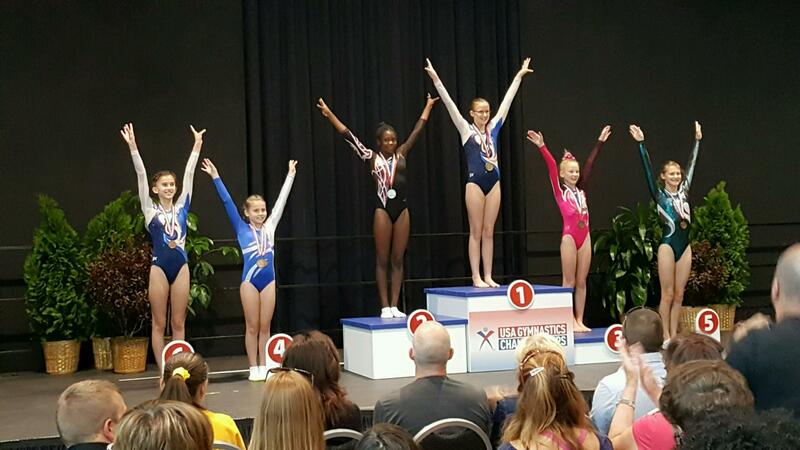 Full competition results can be found on USAG’s website. Results for Fairland’s athletes will be posted soon under the results section of this site. Time to crack those books open and study for final exams! Thanks for all the pictures you sent in. We have some great pictures from the team dinner, a few from out and about in RI, and more meet pictures. If you have more pictures, email them to me. All pictures will be loaded into the picture gallery. Please stand by, we are experiencing technical difficulties (also known as operator error). Greetings from Rhode Island! We have officially reached the half-way point of the 2016 USA Gymnastics Championships. Lily, Andrew, Jessica, and Delilah kicked of Fairland’s participation Wednesday evening with synchro competition. Andrew once again paired up with Casey from World Elite and brought home the gold medal in men’s open elite synchro. Lily and Alyx (Novak’s) paired up for women’s L-10, 17+ synchro winning the silver medal. Jessica paired up with Isabel from Gymagic and secured the silver medal for junior elite women. and Delilah paired up with Courtney (ETA) officially capturing the bronze medal. Thursday and Friday were long days and included all preliminary competiton for all level 9, 10, junior elites, and open elites. Athletes placing in the top 8 in preliminary competion have earned a spot in Saturday’s finals competition. Neomie is currently 1st in L9, 11-12 DMT, Jessica is in 3rd in JR TR, Andrew is 4th in OE TR and L-10, 17+ DMT, Lily is 4th in L-10, 17+ TR, Megan is 4th in L9, 15+ TR. Friday evening we actually managed to get pretty much everyone together (athletes, parents, judges, coaches) outside of the gym! We had a great time eating dinner and socializing. The athletes looked great being all dressed up! It was a lot of fun! Good luck to all our athletes competing in finals! Saturday evening is prelims for senior elite trampoline. Good luck and congratulations to Delilah–how exciting to be able to participate in the final Olympic Selection competiton! 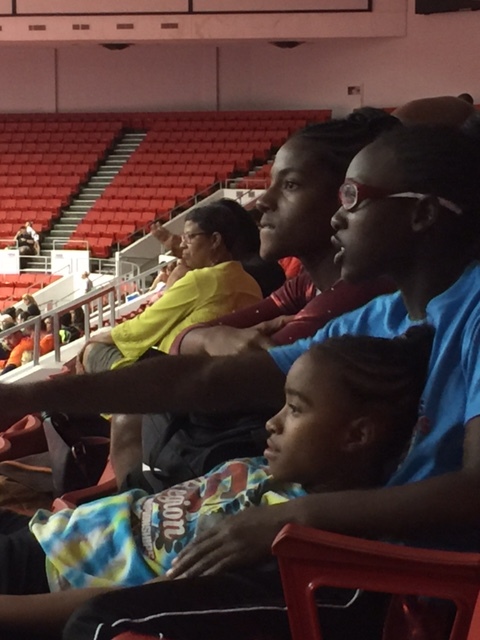 Delilah, Andrew, and Jessica traveled to Colorado Springs last week for the 2016 Elite Challenge. The competition was quite intense as it was an elite mobility meet, the 3rd and final National Qualifier for all elite divisions, the 1st of 2 National team selection meets for eligible juniors and seniors, and the 2nd of 3 Olympic selection meets for eligible seniors. The competition was held at the Olympic Training Center (OTC) in Colorado Springs, Colorado. Between just being at the OTC during an Olympic year and so much at stake for so many athletes, it was intense! No holding back! Go big or go home! Delilah (senior elite) solidly finished her preliminary routines and qualified for finals competition. In finals, she again performed a solid routine, moving up and finishing in 7th place. 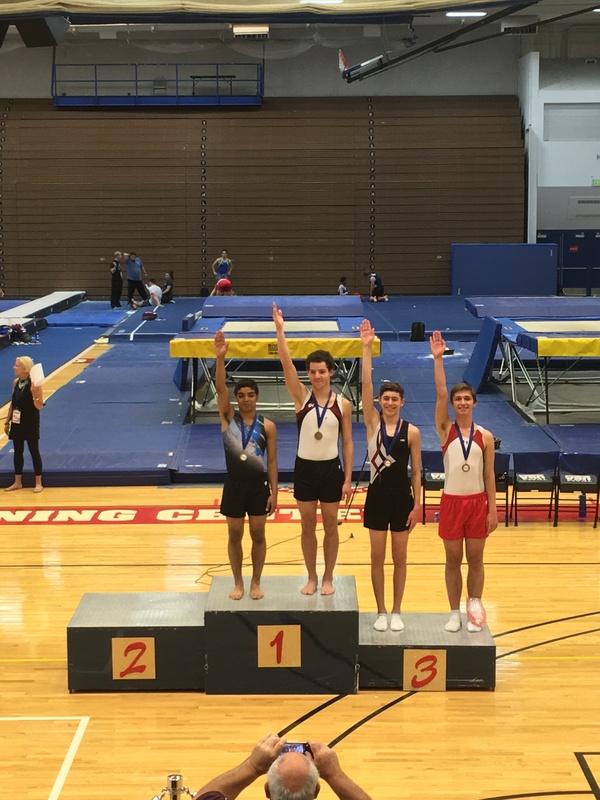 Andrew had a bit of a rough go on individual trampoline (open elite), but he redeemed himself with a last minute synchro pairing/entry where he brought home a gold medal as well as tying for the bronze medal in level 10 DMT. Jessica (junior elite) completed two great routines in prelims-getting new personal bests in both compulsory and optional. She went into finals in 2nd place and completed a solid finals routine–capturing the gold medal. The team managed to sneak away from the competition venue for what seemed like 20 minutes out of the entire 4 days. It rained for about 15 minutes out of the whole 4 days. 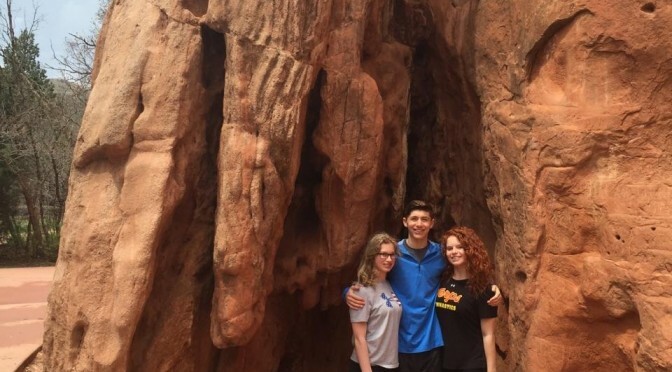 Yes – their timing was impeccable (or NOT), but they did manage to get a quick visit to the Garden of the Gods! 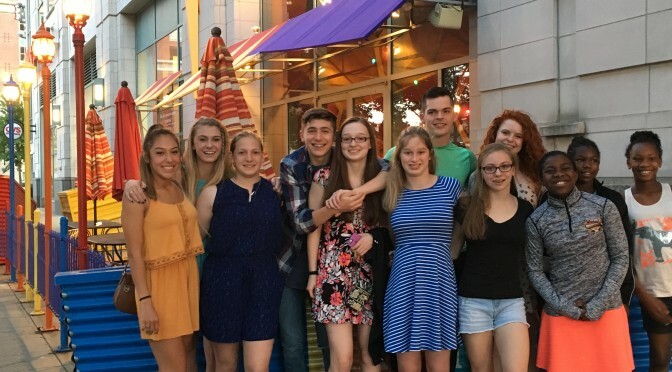 This time of year is very busy: AP exams, final exams, school projects, class/school trips, graduations, spring cleaning, and this year it is time to buckle down for Nationals! For the first time (ok maybe it’s not the first time, but it’s the first time that I know of), Nationals will occur before school is out! The USA Gymnastics Championships is less than 1 month away! This will be a very exciting event as 1. It’s Nationals-what’s not exciting about that?! 2. Olympic Team as well as US National Team will be named! See you there!!! 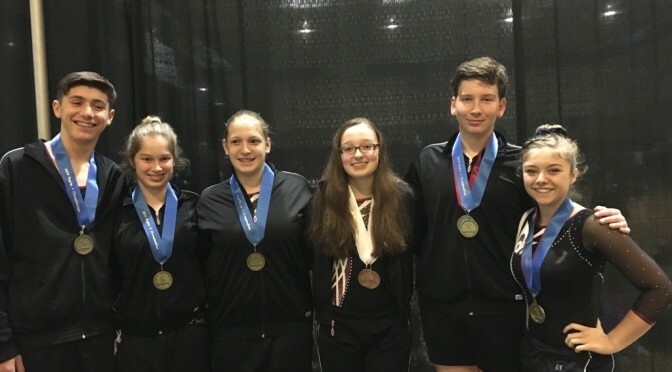 Approximately 580 athletes from 13 states (44 teams) participated in the 2016 Region 6 Championships held in Chantilly, VA. Fairland athletes ‘held their own’ bringing home 18 Regional Champions and 46 National Qualifiers (28 athletes). Congratulations athletes! Congratulations and thank you to all Fairland coaches. Without your hard work and dedication, our athletes’ success would not be possible. Fairland also brought home the 1st place Optional Level Double Mini Team Award, 2nd place Compulsory Level DMT Team Award, and 3rd place Complusory Level Trampoline Team Award. USA Gymnastics divides the country into 6 regions. Maryland is in region 6 which is comprised of: Connecticut, Deleware, Massachusetts, Maryland, Maine, New Hmapshire, New Jersey, New York, Pennsylvania, Rhode Island, Virginia, Vermont, and West Virginia. It is a quick turn around for several of our elite atheletes as they will compete in the 2016 Elite Challenge in Colorado Springs May 4-8. 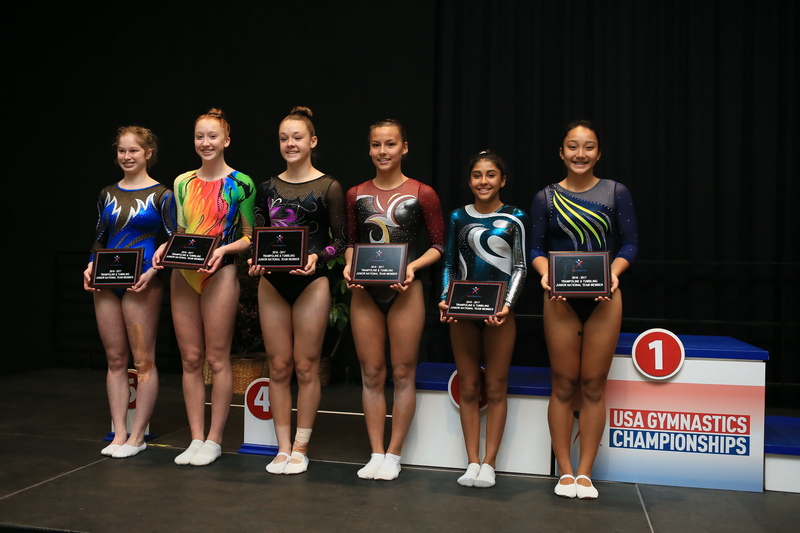 The USA Gymnastics Championships will be held June 8-13 in Providence, RI for qualified level 8 and up athletes followed by the Star and Stripes Championships in Tulsa, OK in July for qualified level 5-7 athletes. Reminder to all- send pictures! This past weekend was a very fun and exciting competition! 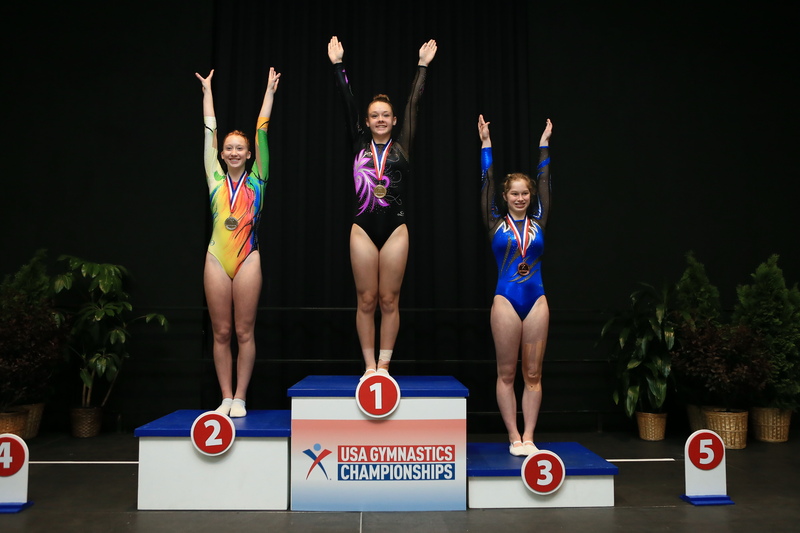 The State Championships is the the first opportunity for athletes to qualify to the 2016 USA Gymnastics Championships to be held in Providence, RI June 8-13, 2016 and/or Stars and Stripes Championships to be held in Tulsa, OK July 21-24, 2016. Fairland had 37 athletes participate in the 2016 State Championships and came away with 46 qualifiers (25 different athletes) and 35 State Champions! Fairland also received the 1st place team award in compulsory level DMT and 3rd place team award for TR. Our optional level athletes swept the first place team awards in all 3 events! Congratulations FAIRLAND!!!! Full results for Fairland athletes will be posted soon under the Results heading of the website. 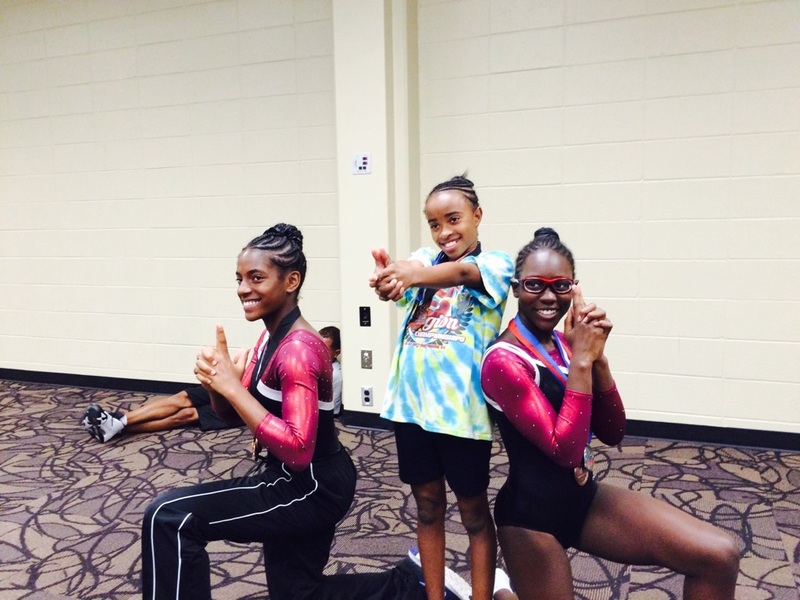 The USA Gymnastics Championships is the ‘Nationals’ for level 8 – elite athletes, while the Stars and Stripes Championships, formerly known as the Level 5-7 National Championships, is the culminating event for level 5-7 athletes. The Region 6 Championships, more commonly called ‘Regionals’, is the 2nd qualification opportunity and is coming up soon (Apr 30-May 1) in Chantilly, VA. Region 6 includes all athletes from: Connecticut, Delaware, Massachusetts, Maryland, Maine, New Hampshire, New Jersey, New York, Pennsylvania, Rhode Island, Virginia, Vermont, West Virginia, and the District of Columbia. A special thanks to all the parents, athletes, and coaches who pitched in/volunteered/provided donations in conjunction with all the teams in the state to make the 2016 Maryland State Championships a success. Great job Fairland! Congratulations to all our athletes! We are proud of you!!!! Jessica will miss the Maryland State Championships this weekend as USA Gymnastics Trampoline and Tumbling Selection Committee selected Jessica to represent USA as one of the 4 (2 girls, 2 boys) junior elite trampoline athletes that will compete at the 2016 Pacific Rim Championships in Everett, Washington April 5 – 11, 2016. 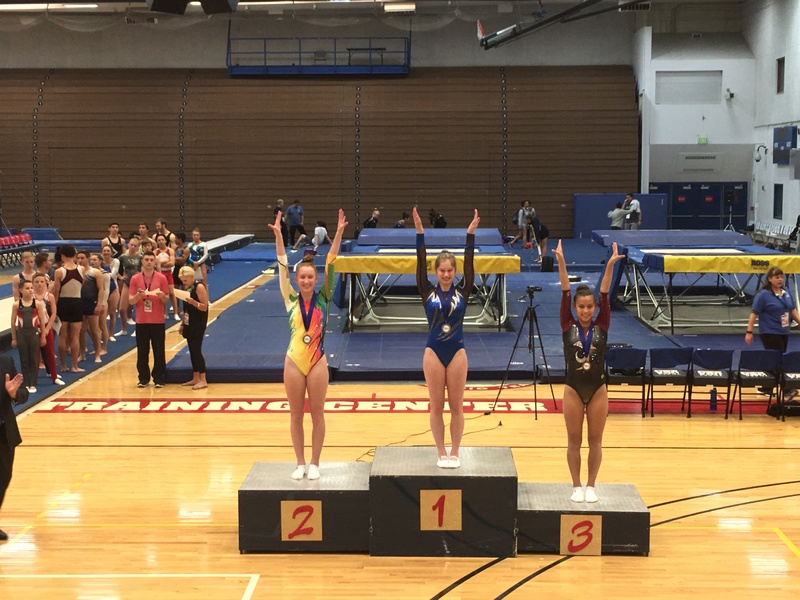 Today’s competition included Women’s Trampoline Team finals and individual prelims. 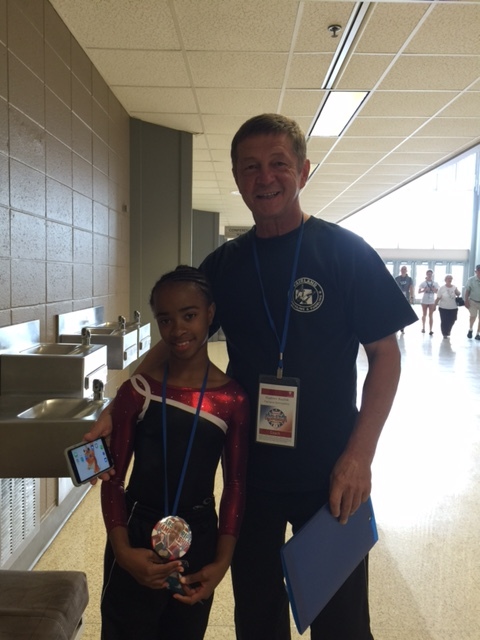 Jessica did a great job; scoring a new personal best and helping Team USA to a team GOLD medal. She has also qualified for individual finals competition, being held on Saturday. The Pacific Rim Championships is a major regional biennial gymnastics competition and is open to teams from member nations of the Pacific Alliance of National Gymnastics Federations (PANGF). The competition includes men’s and women’s gymnastics, trampoline, and rhythmic gymnastics. It is expected to feature more than 200 gymnasts from more than 19 Pac Rim countries including: Australia, Canada, Chile, China, Columbia, Costa Rica, Ecuador, Hong Kong, Indonesia, Japan, Korea, Malaysia. Mexico, New Zealand, Panama, Peru, Philippines, Russia, Singapore, Chinese Taipei, Thailand, and the United States. For trampoline, each country may bring 4 women and 4 men. The US team is comprised of 2 Senior elite athletes and 2 Junior elite athletes per gender. Congratulations Jessica!!! This weekend our level 10 and elite athletes will travel to Battle Creek, Michigan for the Winter Classic Invitational. While level 1-9 athletes can achieve their required scores for mobilizing at any USAG sanctioned competition, level 10 and elite athletes must achieve their required mobility scores at designated USAG competitions. This is one of 5 opportunities this year for level 10s and elites to mobilize. This competition is also the 1st of 3 competitions where senior elites can earn points for potential Olympic Team Selection. It’s going to be an exciting competition! Go Fairland!